One incredibly handy feature of TMG Reporter is the Productivity classification. This can not only be used to display productivity stats on the dashboard but also in defining alerts. Fastvue TMG Reporter uses the native TMG website categories. These categories from a TMG URL filtering perspective are important because they govern which sites are either allowed or denied access. The URL categories are dynamically updated over times as the various reputation sources reclassifies sites as they change or grow. Sites can also have secondary categories. These secondary categories can now also be used in URL filtering if it is selected. For these reasons you may sometimes need to reclassify a particular site URL. 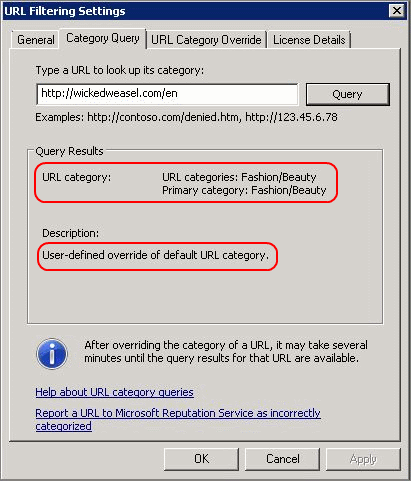 To manually intervene and correct this issue you need to add a URL category override. Make a note of the URL categories that are returned. Select the new Category you would like to move it to. 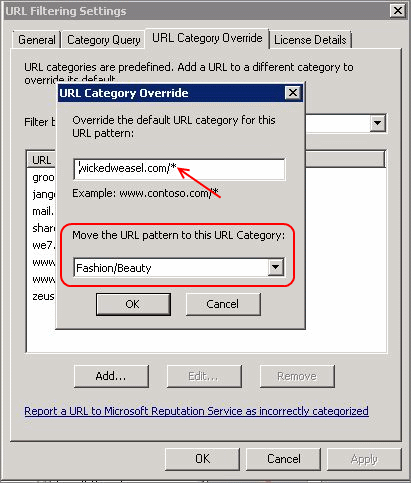 Once the configuration has been updated you can now recheck the URL category for the site. You should now see that the primary category has been changed. The description now also informs you that it is a User-defined override. From a Fastvue TMG Reporter perspective there are some changes you would also want to make to correctly classify the users / company productivity stats. By default the URL categories are sorted in Unacceptable, Unproductive, Acceptable and Productive categories. These will differ based on the company. In my retailer example “Fasion/Beauty” is not only “Acceptable” but would also be deemed Productive. To take this further the “unproductive” category of Alcohol should also shift to Productive since the retailer also sells wine. Doing this in Fastvue TMG Reporter is very simple and intuitive. Simply click and drag the category you want to change to the new classification. Once done Click the Save Productivity Settings button in the top right corner. URL categories are fixed. You cannot add your own. 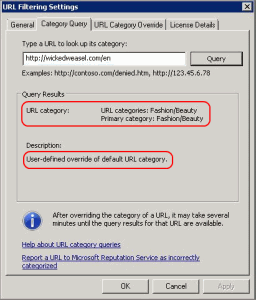 Generally administrators resort to using URL sets. In this case the rule and the report might not match up. Sites that are not classified fall in to the unknown category. They are therefore excluded from the productivity report. Since internal sites would all be unknown, you should also check that the correct and relevant exclusions are set in the proxy auto configuration settings to avoid inefficient routing of traffic through TMG. pls i just want to know cos am new to tmg. If the malware inspection license expired is it suppose to affect the rules.your response will be highly appreciated. Tanx. If your Web Protection Services license has expired, I believe any rules you have based on URL Categories will no longer work correctly. 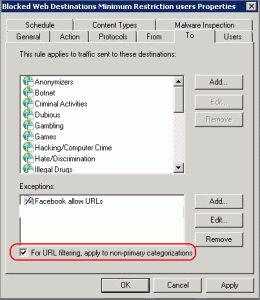 For example, rules such as “Block user xyz to URL Category = Sports”. Foreront TMG will no longer know what sites belong to the Sports category, so the rule will not function, and your user will be able to access Sport sites again. From personal experience I can confirm that Scott’s explanation is correct. If you renew the license things will start being filtered again.